I’ve tried to write this post maybe 10 times already, but the words keep escaping me. Does that ever happen to you? I keep starting a paragraph, deleting it, and starting again. I don’t know how to express my excitement appropriately. Here goes nothing. Raffi is no longer allergic to peanuts, as confirmed by his peanut challenge at the hospital yesterday. This means so much for us. For me personally, it means not having to panic in social situations, keeping my eye out for any potential peanut products. It means not having anxiety over making sure I have his Epi-pen and Benadryl at all times. It means being able to share food with him and not having to chase Alessandra as she drinks a peanut butter banana smoothie to make sure she doesn’t get close to him. I will no longer have to ask what kind of oil is used in a restaurant or how an ice cream shop separates its scoops. For Raffi it means even more. He won’t have to ask me every single time he wants to eat anything. He can enjoy so many more foods. He can eat peanut butter sandwiches and peanut butter banana smoothies and KIND bars and PEANUTS! He already asked if he can buy the peanuts in the shell to eat. I am really emotional about this, and really excited too. Leading up to his challenge date I was having anxiety and feeling really nervous about him trying it. I failed to think about how nervous he would be. I didn’t even know food challenges existed until my son qualified for one. Last September his skin test for peanut allergy came back within the boundaries to qualify for a challenge. While we originally booked it for October, both a slight fever and his young age made me cancel it. We rebooked it for yesterday. In a food challenge, a person is given small but increasing amounts of the food and monitored closely for a reaction. In Raffi’s case, it meant increasing doses of peanut products with an observation of 2-3 hours at the end of the challenge. They can have clear liquids but nothing else until an hour after the last dose is given. The first hour was tough and Raffi absolutely refused to try the peanut powder mixed with yogurt or applesauce. I fought back tears multiple times, thinking we wasted a precious space in the challenge location and that the challenge would be considered incomplete. It took us months to get our appointment, and I also felt terrible for wasting the nurses and doctor’s time. Raffi was clinging to me for dear life and it was hard to get him to calm down enough to even have a sip of water. To be honest, I don’t blame him. First, peanut powder mixed with applesauce or yogurt tastes nasty. Second, we’ve spent almost his whole life making him deathly afraid to eat peanut products, and now we were telling him to eat them? 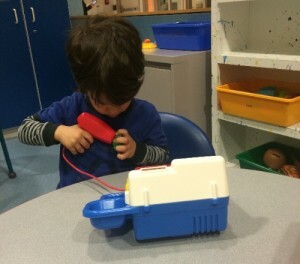 Third, he’s a threenager who doesn’t want to be forced to do anything he doesn’t want to do. The nurses were really great about trying different tactics, but nothing was really working. Finally, we/they decided to have him try straight up peanut butter on tiny pieces of cracker, doubling the dose every 20 minutes until he completed the challenge. By the 4th dose he was begging for more and stuffing the bites in his mouth. By the 6th and final dose, he was chattering with a mouth full of peanut butter talking about how “nummy” it was. 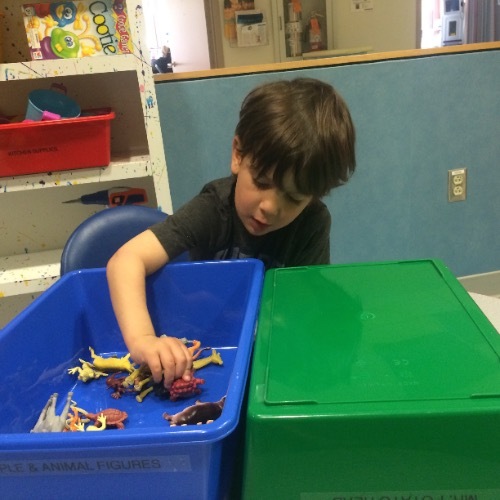 During this long day he watched a ridiculous amount of TV, played in the small playroom, made a forest and a lake out of toy bins, read a few books, and had some long chats together. He had two clear favorite activities – playing with the ants from the Cooties game, which he held in his hands almost the whole time, and the medical gloves and stethoscope the nurse let him hold and play with for awhile. He was a champ. They observed him for 3 hours after the last dose, and he had no reaction. NO REACTION! I’m so excited and so happy for him. Hurray for growing out of his allergy!!! The allergist instructed me to make sure he consumes peanut products a minimum of 2-3 times a week to ensure he doesn’t redevelop an allergy. Sounds good to me! Raffi woke up this morning and immediately announced that he was so excited for a peanut butter sandwich for lunch today. PS- One thing they didn’t prepare me for was the nerves I’d still have. I can’t imagine, yet, not carrying around his Epi-pen or worrying about what he’s eating. I’m guessing that will take some time. Sabrina, I am so happy for you. I can imagine how important this is and congratulations!!! Great news Sabrina!! So happy for you guys and Raffi especially! I am SO excited for you. 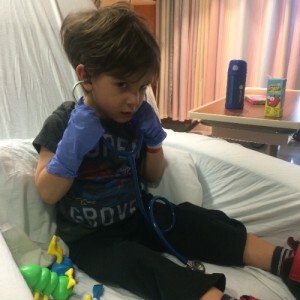 My son [age 2] has a peanut allergy. 🙁 They said he is unlikely to outgrow it because his bloodwork was bad —- peanut iGe # in the 50’s…did R have any bloodwork or indications that he was or wasn’t likely to outgrow?? ALSO – did you do anything different with Alessandra? I’m pregnant with #2 and would love to do anything I can to prevent it this time. It’s so hard to not feel responsible! 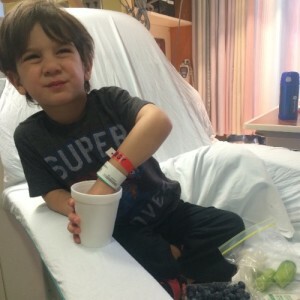 Taking probiotics this time around but who really knows what helps……..
I’m sorry about his allergy! We never did blood work – only skin tests. I don’t know the numbers off hand, but he tested pretty severely the first two years (9 months old and age 2) and at age 3 his skin test came back within the parameters to qualify for a food challenge. It was still positive, but I guess it was significantly less positive? I sound so untechnical and I’m sorry about that – I don’t understand any of it. The allergist told me off the bat that Raffi has a 20% chance of outgrowing the allergy by age 5. I don’t know why they said that – if it’s a normal stat or based on his results specifically. I didn’t do anything different in Ali’s pregnancy and not in this pregnancy either. I still eat peanut products. I still take the same prenatal vitamin. Best of luck and congratulations on baby #2! Thanks!! That makes sense. My son had a bigger skin reaction and worse bloodwork for peanut but smaller skin reaction and better blood result for almond. She was going to let us challenge the almond but the day of he reacted just a bit too much when we put it on his skin. We are going to recheck everything at 3. So crazy. Your post gives me hope though, for my son and Baby 2, and I really appreciate you sharing. I don’t know anyone around me yet who also understands what it’s like to bring the epic pen everywhere and not be able to trust the random snacks and desserts all the other toddlers are eating (and dropping bits of everywhere) at playgroups etc. So exciting! 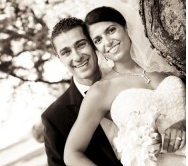 I can’t imagine how stressful that was for you and Raffi, but the end result is awesome. It doesn’t hurt to carry an epi pen around still, you never know when you, the kids or someone else might need it. That is very exciting news!!! My son outgrew his around age 6 but HATES the taste of peanut anything! We are supposed to have him eating peanut products fairly often so the allergy doesn’t come back but we have to literally bribe him to even eat a peanut. I can’t even get him to eat Reeses! It has been a struggle but I am still glad he is no longer allergic. Like you said, it’s a relief not to have to ask questions everywhere or be on high alert! That is great news! It’ll be a whole new world to him. Although I am not a mother, I’ve been a nanny with the same family for 7 years and have learned how tough allergies can be. Raffi must be so excited! I am so happy for you and especially for your son. Could I ask what allergist you go to? 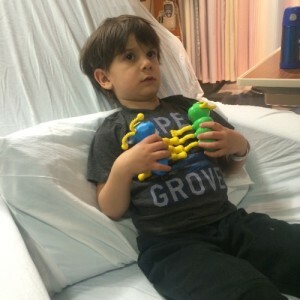 I am trying to find an allergist to talk about desensitizing my 5 year old son.